Wir machen unseren eigenen Staat auf. Betreff des Beitrags: Re: Wir machen unseren eigenen Staat auf. Ich will Kühe! Und Granatäpfel. Für Granatapfel-Sahneeis. Soviel Staat muß sein. Libertatia (also known as Libertalia) was a possibly fictional anarchist colony founded in the late 17th century in Madagascar by pirates under the leadership of Captain James Misson. Whether or not Libertatia actually existed is disputed. It is described in the book A General History of the Pyrates by Captain Charles Johnson, an otherwise unknown individual who may have been a pseudonym of Daniel Defoe. Much of the book is a mixture of fact and fiction, and it is possible the account of Libertatia is entirely fabricated. Although the existence of Libertatia is contested, the radical ideas that it represented were very common in various pirate-era events. After the American Revolution, pirates fleeing from England crashed on an island and set up their own Libertatia. They called their new island "the Republic of Spensonia", and according to A. L. Morton, it "looks backward to the medieval commune and forward to the withering away of the state." The pirates were against the various forms of authoritarian social constructs of their day, monarchies, slavery, and capital. The pirates practiced forms of direct democracy, where the people as a whole held the authority to make laws and rules, and used systems of councils with delegates, who were supposed to think of themselves as "comerads" of the general population, and not rulers. The pirates created a new language for their colony and operated a socialist economy. [The] pirates were anti-capitalist, opposed to the dispossession that necessarily accompanied the historic ascent of wage labor and capitalism. They insisted that "every Man was born free, and had as much Right to what would support him, as to the Air he respired." They resented the "encroachments" by which "Villains" and "unmerciful Creditors" grew "immensely rich" as others became "wretchedly miserable." They spoke of the "Natural right" to "a Share of the Earth as is necessary for our Support." They saw piracy as a war of self-preservation. [They redefined the] fundamental relations of property and power. They had no need for money "where every Thing was in common, and no Hedge bounded any particular Man's Property," and they decreed that "the Treasure and Cattle they were Masters of should be equally divided." Misson's crews often were half white and black. The pirates have been reported to have freed enslaved people because the idea of slavery went against their own ideals of freedom. The pirate utopia's motto was "for God and liberty," and its flag was white, in contrast to a Jolly Roger. They were anarchists, waging war against states and lawmakers, attacking their ships, sparing prisoners, and freeing slaves. They called themselves Liberi, and lived under a communal city rule, a sort of worker owned corporation of piracy. They had articles (shared codes of conduct), and used elected systems of re-callable delegates. he fell upon Government, and shew'd, that every Man was born free, and had as much Right to what would support him, as to the Air he respired... that the vast Difference betwixt Man and Man, the one wallowing in Luxury, and the other in the most pinching Necessity, was owing only to Avarice and Ambition on the one Hand, and a pusillanimous Subjection on the other. Embarking on a career of piracy, the 200 strong crew of the Victoire called upon Misson to be their captain. They shared the wealth of the ship, deciding "all should be in common." All decisions were to be put to "the Vote of the whole Company." Thus they set out on their new "Life of Liberty." Off the west coast of Africa they captured a Dutch slave ship. The slaves were freed and brought aboard the Victoire, Misson declaring that "the Trading for those of our own Species, cou'd never be agreeable to the Eyes of divine Justice: That no Man had Power of Liberty of another" and that "he had not exempted his Neck from the galling Yoak of Slavery, and asserted his own Liberty, to enslave others." At every engagement they added to their numbers with new French, English and Dutch recruits, and freed African slaves. While cruising round the coast of Madagascar, Misson found a perfect bay in an area with fertile soil, fresh water and friendly natives. Here the pirates built Libertalia, renouncing their titles of English, French, Dutch or African and calling themselves Liberi. They created their own language, a polyglot mixture of African languages, combined with French, English, Dutch, Portuguese and native Malagasy. Shortly after the beginning of building work on the colony of Libertalia, the Victoire ran into the pirate Thomas Tew, who decided to accompany them back to Libertalia. Such a colony was no new idea to Tew; he had lost his quartermaster and 23 of his crew when they had left to form a settlement further up the Madagascan coast. The Liberi - "Enemies to Slavery," aimed to boost their numbers by capturing another slave ship. Off the coast of Angola, Tew's crew took an English slave ship with 240 men, women and children below decks. The African members of the pirate crew discovered many friends and relatives among the enslaved and struck off their fetters and handcuffs, regaling them with the glories of their new life of liberty. The pirates settled down to become farmers, holding the land in common - "no Hedge bounded any particular Man's Property." Prizes and money taken at sea were "carry'd into the common Treasury, Money being of no Use where every Thing was in common." Captain Charles Johnson is the British author of the 1724 book A General History of the Robberies and Murders of the most notorious Pyrates, whose identity remains a mystery. No record exists of a captain by this name. Some scholars have suggested that "Charles Johnson" was actually Daniel Defoe writing under a pen name, but this is disputed. His work was influential in shaping popular conceptions of pirates, and is the prime source for the biographies of many well known pirates. Papas Prinzessin: Der Amerikaner Jeremiah Heaton hat eine Flagge auf einem Stück Wüste zwischen Sudan und Ägypten gehisst und erklärt, das Land gehöre seiner siebenjährigen Tochter. Ein Gespräch über Völkerrecht und die Liebe zum eigenen Kind. Die Süddeutsche Zeitung aber auch - die Story ist mindestens drei Jahre alt. 2014 jo kann mich trotzdem nicht erinnern die hier schonmal gelesen zu haben. Jetzt wo ich so darüber nachdenke... woran erinnert mich nur der Threadtitel? woran erinnert mich nur der Threadtitel? ... mit Black Jack und Nutten. 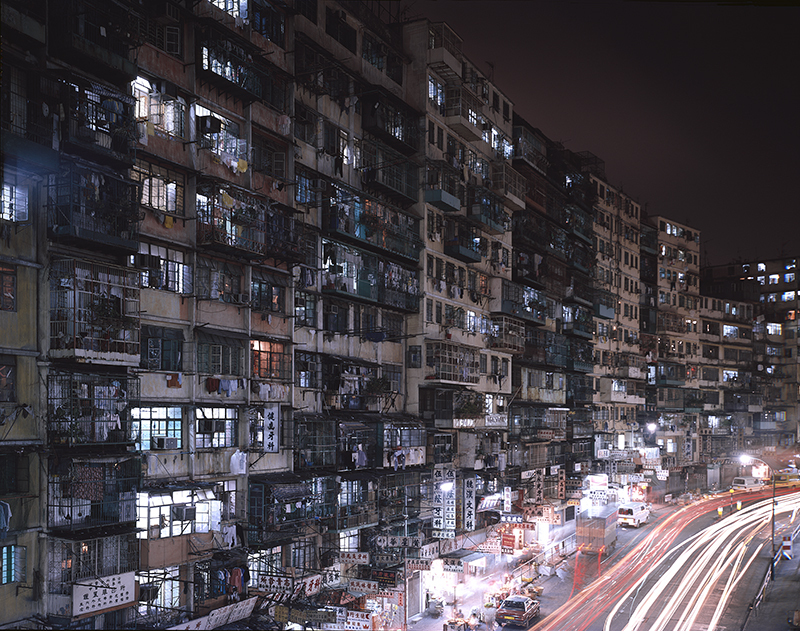 Hatten wir die Kowloon Walled City noch nicht im Forum? 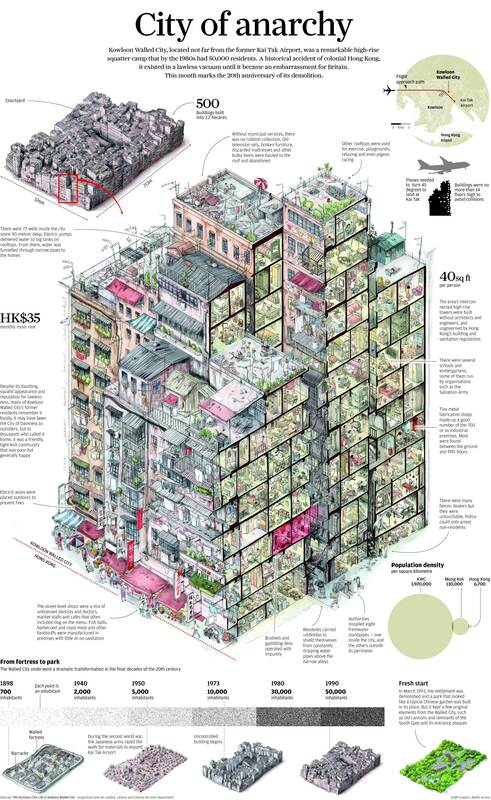 Kowloon Walled City (chinesisch 九龍寨城 / 九龙寨城, Pinyin Jiǔlóng Zhàichéng, Jyutping Gau2lung4 Zaai6Sing4, kant. 九龍城寨 / 九龙城寨 Pinyin Jiǔlóng Chéngzhài Jyutping Gau2lung4 Sing4zaai6), war ein Stadtteil in Hongkong auf der Halbinsel Kowloon mit lange Zeit ungeklärtem rechtlichen Status. Umgangssprachlich wurde er auch Walled City (dt. Ummauerte Stadt) genannt bzw. auf kantonesisch als Hak Ngam zi Sing (黑暗之城, Hēi'àn zhī Chéng, Jyutping Hak1ngam3 zi1 Sing4), die Stadt der Dunkelheit, bezeichnet. Im Jahr 1987 lebten 33.000 Menschen auf einer Fläche von knapp 0,027 km². Die Bevölkerungsdichte betrug 1,3 Millionen Einwohner je Quadratkilometer und war die höchste der Welt. Ursprünglich war die Walled City ein militärischer Außenposten (寨, zhài ‚befestigter Außenposten‘) der Chinesen. 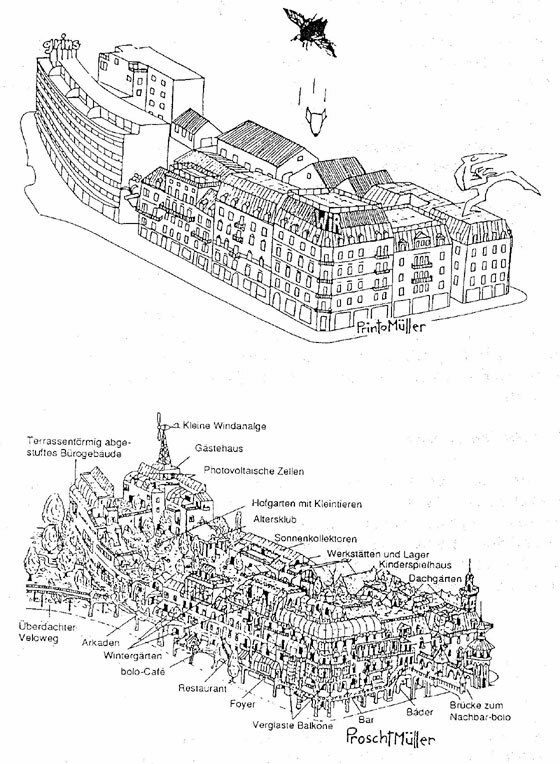 Nachdem die New Territories 1898 von Großbritannien gepachtet worden waren, wurde die Walled City zu einer chinesischen Enklave. Nach dem Ende der japanischen Besetzung Hongkongs im Zweiten Weltkrieg fanden viele chinesische Flüchtlinge hier preiswerte Wohnungen, und die Bevölkerung begann dramatisch anzuwachsen. Die Walled City wurde unkontrolliert mit bis zu 14-stöckigen Hochhäusern dicht bebaut. Die Wohnungen waren im Durchschnitt etwa 20 m² groß und wurden meist von ganzen Familien bewohnt. In der Walled City gab es Geschäfte, Schulen, kleine Handwerksbetriebe und nicht lizenzierte Zahnarztpraxen, sie war jedoch auch das Zentrum von Drogenhandel und Prostitution. Kontrolliert wurde der Komplex von den Triaden. 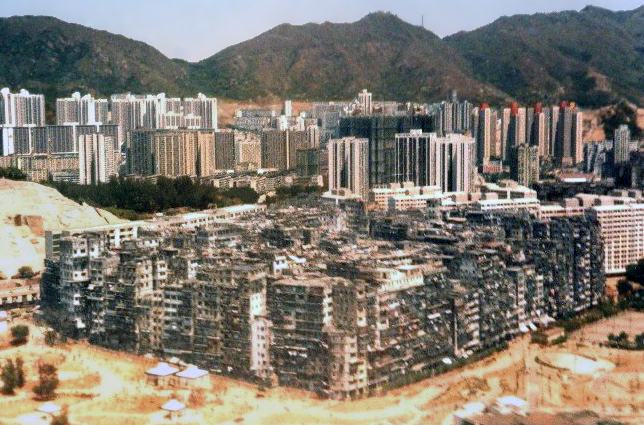 Nach der mehrere Jahre andauernden Räumung wurde die Walled City von 1993 bis 1994 abgerissen, Ende 1995 wurde auf dem Platz der Kowloon Walled City Park eröffnet. Noch ein Artikel, in dem weiter unten noch ein kleinerer, bis heute bestehender Komplex in Hong Kong namens Chungking Mansions erwähnt wird. Auf demselben Blog ist auch ein Artikel über eine "Wohnzitadelle" aus dem 19. Jhd mitten in Paris. Sieht auch spannend aus.